Universal Compatibility-The apple watch bumper case perfectly works with apple watch series 3/2/1, iwatch Sport/Edition/Nike+. Easy installation-Plug your apple watch in, the apple watch cover defense works like a skin to protect it well. Easy to put it on and off. Access to all controls, buttons, sensors and Apple watch features. 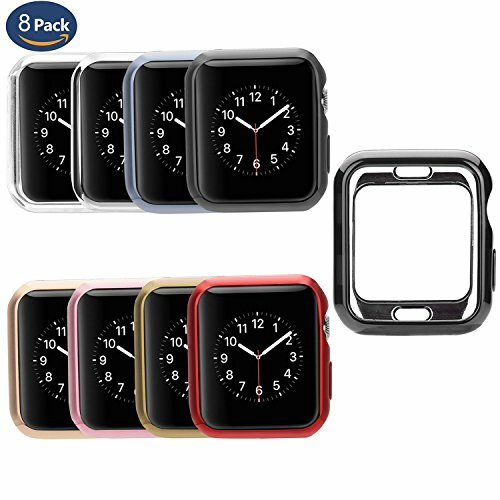 Superior Quality-The iwatch bumper cover is made of premium tpu material, durable and reliable; soft and smooth; ultra-slim and lightweight. Delicate Appearance-Shiny luxury iwatch cover case in simple style shows elegance and nobility. Perfect for business, ceremony, party and daily use. A lot of colors available, like black, silver, rose gold, gold and transparent.